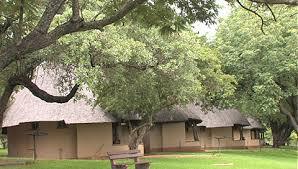 Wild Mangos occur naturally in the Kruger Park to the east of the rest camp Crocodile Bridge only. There happen to be Wild Mango trees in the Crocodile Bridge rest camp. One of them stands behind the hedge separating the filling station area and the safari tents. Wild Mangos are medium to large trees growing up to 23m in height, with spreading flattish crowns. It has long compound leaves that are a shiny bottle-green. The mature bark is rough, dark brown and fissured. 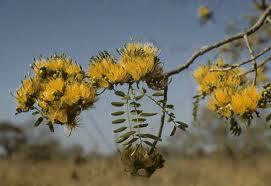 The yellowish-orange flowers are borne in sprays from September to October, and resemble an old fashioned powder puff. Unusually for the legume family, the fruit develops from the standard pod shape when young, up to 80 mm long golden-yellow and glossy ovoid fruit with a thick stalk and looks like a small yellow mango, is rich in vitamin C and is edible. They can be enjoyed either fresh or cooked. Elephants love the fruit. Cordyla means club and refers to the shape of the fruit. 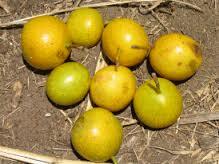 Africana means that it is the only fruit of its kind in Africa. Gleaned from the pen of Marissa Greeff in her book A Site-by-Site Guide to Trees in the KRUGER NATIONAL PARK. This book is available from us for R260.00 excluding postage. 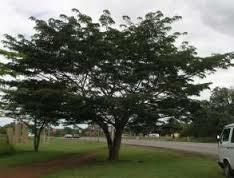 The Wild Mango is available for sale at the Kruger Indigenous Tree Nursery near Skukuza.